•Gillette's best shave. Reengineered thinner blades effortless glide. •Less tug & pull. •Microcomb helps guide hair to blades streamlined comfort guard, new channels clear away excess prep •Now consumers can experience incredible comfort, even if they shave every day. 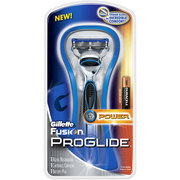 Product Description The Gillette Fusion ProGlide Special Edition helps you get a great start everyday. Engineered to turn everyday shaving into gliding, inside the handle of the ProGlide Power Razor lies an On-Board Microchip that delivers soothing micropulses for incredible comfort. This Special Edition handle has a golden look to commemorate the London 2012 Olympic Games. Fusion ProGlide Power’s Reengineered Low Cutting Force blades are thinner and finer1 with advanced low-resistance coating to cut effortlessly through hair with less tug and pull2 . A Blade Stabilizer maintains optimal blade spacing for comfort, enabling the blades to adjust to the contours of a man’s face. Next, the streamlined Snowplow Comfort Guard channels excess shave prep to produce optimal blade contact, stretching the skin for a close, comfortable shave. And the Enhanced Lubrastrip® is infused with mineral oil and lubricating polymers that allow the razor to move smoothly over skin, even on repeat strokes. Exclusive to the Gillette Fusion ProGlide Power, an innovative Microcomb guides stubble to the blades, while the handle with bigger, more ergonomic grips than Fusion offers great control. A Low-Battery Indicator Light signals when to change the AAA battery, so you always have power when you need it. Finally, the Automatic Shut-Off turns off the razor after eight minutes in case of accidental activation, which protects the battery during travel. Power. Performance. Precision. It’s time you experienced Gillette’s best shave yet3 . Additional Product Features •Low Cutting Force Blades are thinner and finer (the first four blades vs. Fusion) and our advanced low-resistance coating, enabling the blades to cut effortlessly through hair with less tug and pull than Fusion. •A Blade Stabilizer to maintain optimal blade spacing for comfort, while allowing the blades to adjust to the contours of a man's face. •A streamlined Comfort Guard which channels excess shave prep to help maintain optimal blade contact, stretching the skin for a close, comfortable shave. •An Enhanced Lubrastrip®—larger than before—infused with mineral oil and lubricating polymers, enabling the razor to move smoothly over skin even on repeat strokes. •An improved Precision Trimmer over Fusion, including an enhanced blade, a comb guard to help align long hairs and rinse-through slots. •A Handle with bigger, more ergonomic grips over Fusion for great control. •Microcomb, exclusive to Gillette Fusion ProGlide Power, helps guide stubble to the blades. •The razor handle features an on-board microchip that provides consistent power, shave after shave. •A Low-Battery Indicator Light signals when to change the AAA battery, so you always have power when you need it. •Automatic Shut-Off turns off the razor after eight minutes in case of accidental activation, and protects the battery during travel.